InterCoin Capital operates in the cryptocurrency MLM niche. Outside of two Gmail addresses, no corporate details are provided on the InterCoin Capital website. The company does have an official LinkedIn profile (“INTERCOINCAPITAL”), which cites California as its base of operations. From what I’ve seen InterCoin Capital is being primarily marketed across south-east Asia. There is no evidence to suggest InterCoin Capital has any physical business operations in the US. Arayan (right) does appear to be an actual person, as evidenced by multiple photos and videos taken at InterCoin Capital promotional events. Outside of InterCoin Capital itself though, Arayan doesn’t have an independent online footprint that can be verified. Along with InterCoin Capital (and Arayan) purportedly being based out California, I’m flagging this as highly suspicious. Read on for a full review of the InterCoin Capital MLM opportunity. InterCoin Capital has no retailable products or services, with affiliates only able to market InterCoin Capital affiliate membership itself. Once signed up, InterCoin Capital affiliates invest in ICC points through the company’s “ICB Wallet” website. ICB purportedly stands for “International Coin Bank”. 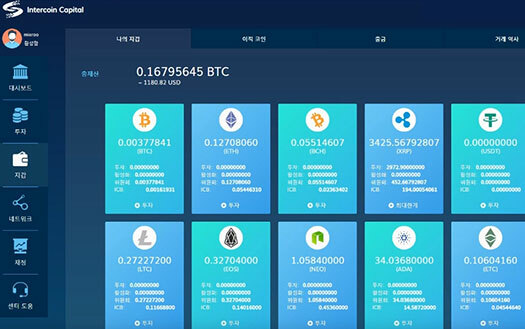 The ICC Wallet website serves as InterCoin Capital’s backoffice. Through it affiliates can trade ICC among themselves, invest and put in bitcoin withdrawal requests. InterCoin Capital affiliates invest bitcoin for ICC points, on the promise of a daily 0.4% ROI. InterCoin Capital splits ROI withdrawal requests 70% in bitcoin and 30% in ICC points. A 100% match is paid on ROI payments to personally recruited affiliates. InterCoin Capital pay residual commissions via a unilevel compensation structure. InterCoin Capital caps payable unilevel team levels at ten. An 8% residual commission is paid out as a percentage of funds invested across these ten unilevel team levels. Whether InterCoin Capital split residual commission payments 70%/30% as with ROI withdrawals is unclear. InterCoin Capital affiliate membership is free. To participate in the attached income opportunity however an affiliate must invest cryptocurrency. No minimum investment amounts are specified on the InterCoin Capital website. InterCoin Capital are pretty cagey regarding specifics of their MLM opportunity. Off the bat it should be obvious that this is not how a legitimate company operates. If you dig around though you can get to the bottom of what InterCoin Capital are actually marketing; a 0.4% daily ROI supposedly generated via AI bot trading and arbitrage. Naturally no evidence of any of these activities is provided, nor does InterCoin Capital provide any alternative verifiable source of revenue entering the company. As it stands the only verifiable source of revenue entering InterCoin Capital is new affiliate investment. And from there it’s the same old MLM cryptocurrency Ponzi scheme model. New InterCoin Capital affiliates sign up and invest cryptocurrency on the promise of a daily 0.4% ROI. That ROI is paid out of subsequently invested funds, with 30% paid in ICC points to prolong the scam just that little bit longer. ICC points are completely worthless and serve no purpose outside of instilling a false sense of wealth among gullible InterCoin affiliates. As far as I can tell ICC points are currently not tradeable and don’t exist outside of InterCoin Capital’s ICB Wallet website. Expect ICC to appear on a few dodgy lesser-known cryptocurrency exchanges when the time comes for Roman Arayan and friends to inevitably exit-scam. That’ll happen when InterCoin Capital affiliate recruitment slumps, simultaneously starving the company of ROI revenue. I’d almost be willing to bet “Roman Arayan” isn’t the actual name of InterCoin Capital’s CEO. But in any event, if they’re going to pretend to be based out of California, InterCoin Capital fails the regulators test with neither the company, ICB Wallet or Arayan registered with the SEC. As per US securities law, this is a requirement for any US company offering securities, which InterCoin Capital’s cryptocurrency investment scheme most definitely is. The math behind a Ponzi scheme guarantees that when they collapse, the majority of investors lose money. InterCoin Capital will play out no different, with investor losses maximized through use of cryptocurrency.